I recently started taking an online meditation teacher training course. I’ve had a meditation practice for years; and have always wanted to go deeper in my practice and teaching. One of the assignments requires journaling after every meditation I do. I notice that putting pen to paper and writing about my experience is truly insightful. I often go to sit down with a million things going on in my mind; and some negative thoughts about myself. 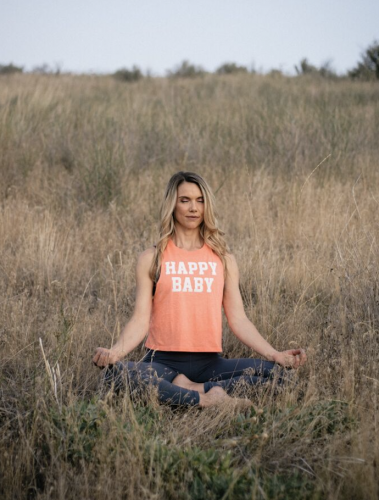 I worry I’m not being a good enough mom, or I’ve let a student down since I had to cancel on them, or I am not as strong as some of the amazing yogis I follow on Instagram. I sit and quiet my mind for anywhere from ten to forty minutes; and afterwards, I feel so much better. I listen to my breath, let the negative thoughts arise and remind myself I am strong, I am loving, I am a healthy, and happy human being. Try and observe without judging why these thoughts come up. Start to replace any negative thoughts with positive ones instead. Then, I try and let go of my thoughts and try and remain steady on my breath. I repeat ” breathing in, I am breathing in, breathing out, I am breathing out.” Or listen to my guide as they focus on certain loving kindness topics. We are often our own worst enemies. We say the things to ourselves that we would never say to a loved one or friend. It can take practice to flip our thoughts. So the negative voice turns to a positive one and we become our own cheerleader. When we meditate we let go of judgment and we discover our infinite potential. Meditation helps us get to know ourselves better and better. Movement also helps us find our strengths and helps us build a healthy body image and overall love for what our bodies can do. Find a form of movement that you enjoy. I truly love practicing yoga and Pilates. Every time I connect my mind, body and breath, I feel more confident and discover a new way of living in my body. Other ways to get to know yourself better can be reading, journaling, talking to a therapist, even fun things like reading your horoscope (I love the AstroStyle blog), looking at your numerology, (browse some free numerology charts) or taking the Meyers Briggs test. Every bit of data offers feedback. Whether you believe in astrology or not for instance just your reaction to the explanation about your sign gives you insight about how you think and what you want to believe. In my meditation course, they talk about the power of placebo. I truly believe our thoughts create our reality. When we think positive and give ourselves a constant pat on the back, we live a healthier, happier life. Our mood shifts and we act out of loving kindness to ourselves and others. I have some meditations on my site that I would love for you to try. If you are feeling down just meditating for five minutes can boost your mood. My Newest Collaboration PRENATAL YOGA SCULPT DVD! Yoga Poses For StudentsPilates Mat 2.0 on YogaGlo!